Here are a couple of photos from the 2018 ECOL Conference. Click here to see all photos. The Evangelical Church of Liberia is very grateful to our donors for partnering with us to demonstrate the love of God to a hurting, needy people. Your partnership has enhanced the work of our ministry, and it has also given the church a good testimony, and we are very grateful. In March of 2014, the first confirmed case of the deadly Ebola virus was reported in Lofa, northern Liberia having spread from the neighboring country of Guinea where it had been spreading fast and claiming many lives. By the end of 2014, Liberia became the epicenter of the deadly viral outbreak that claimed more than 10,000 lives in Guinea, Liberia and Sierra Leone. During the outbreak that lasted for a little over two years, Liberia’s already fragile health care system completely collapsed, the economy broke down and the result was chaos, trauma, death, untold suffering and pain. Liberia was officially declared Ebola free just over two months ago, and Guinea and Sierra Leone have also been declared free of the outbreak, but the effects of the virus still linger on and will probably continue for some years to come. In the midst of this situation the Evangelical Church of Liberia through her emergency relief response, aims to demonstrate the love of God in a tangible way to the needy, and use every opportunity to share Christ. We were able to provide relief assistance to twenty-five direct beneficiaries during the period under review. We had to target 25 due to the limitation of fund. These are additional beneficiaries who have not previously benefited from our regular relief assistance, and are all non-ECOL church members except one (an orphan). The beneficiaries included 9 Ebola survivors, 15 Ebola orphans and a mother. We also had a special case – a widow – that was a late inclusion, and we helped to do a partial renovation of her roof since it leaked very badly. Because the beneficiaries come from families, and considering our traditional extended family practice, we believe that nearly 100 people benefited from the emergency relief assistance. Each beneficiary received a package of 7 relief items which included the following: one 25 kg. bag of rice, a 3 gal. container of refined oil, a dozen of bath soap, 20 pcs of laundry soap, one pc. of mosquito net, one pack of cube (for cooking), and two tubes of toothpaste. A package was sometimes doubled based on the family size and/or condition of the beneficiary. Some of the beneficiaries were recruited from trauma healing small groups we facilitated for Ebola survivors, or from assessment done in vulnerable communities. We verified and obtained copies of Ebola survivors’ certificates to make sure they were our target beneficiaries. A few of them could not locate their certificates but we were able to confirm that they were survivors. You will find the certificates of survivors along with the photos we have attached. Ebola survivors here still face serious health problems left on by Ebola, and they also still face stigmatization in many communities. Our team also reached out to the communities and churches to help people to accept survivors and helped them rebuild their lives. Some of the survivors have visual problems, weakness, stomach ache, memory loss, etc. Ebola orphans are in the care of family members or “good Samaritan” community members. We ensure that they are accompanied by their caretakers to receive their relief items, and we follow them up for assessment and counseling where possible. By the time the fund arrived, most primary schools were closed or about to close so we did not pay tuition for orphans, but we rather used the allocation to increase needy relief items. If funds are available for the next relief response, we intend to provide tuition that will enable orphans to be in school. Additionally, we were able to do partial renovation of the homes of two of the beneficiaries. The roofs of both Grace Gibson (female, age 60 and widow) and Ezetta (female, adult) leaked very badly and had been in need of repair for more than 2 years, contributing to health problems (especially during the wet season) for they and the children who live with them. Help came through our assistance and they now have new metal zinc roofs over the worst affected parts of the roof. Please see attached photos. Rita R. Saah, caretaker-grandmother of 2 Ebola orphans (Rita – age 6, and Mercy – age 3), told us when we surprised her with the relief items for the children: “I am so happy today and it’s like I am dreaming. It has been very difficult for me to find food for myself and the little ones, or to even get them in school since their parents died. I have been praying and praying, but my pains only increase. I am so happy for such a great, big help. God really cares for us. Thank you so much. This report covers the activities of the Jamaica Road Evangelical Church Mission and church planting team during the first quarter of the year as well as a mission trip to Gbarpolu couty which took team to four major Towns in Kongba district. The mission team during the period under review reached out to the Town of Weajor,one of the strong hold of Islam in the western region of Liberia. For the first time in the history of the Town,a church was planted and constructed during the Easter week,(March 25th to 27th) by the Jamaica Road Evangelical Church mission team headed by Elder John Deguah in partnership with the great commission Moment of Liberia. Its all started with a church planting survey early this year conducted by the team,which eventually follows a meeting with Elders of the Town in the middle of February 2016 in Weajor Town which was well attended by almost all of the key holders. 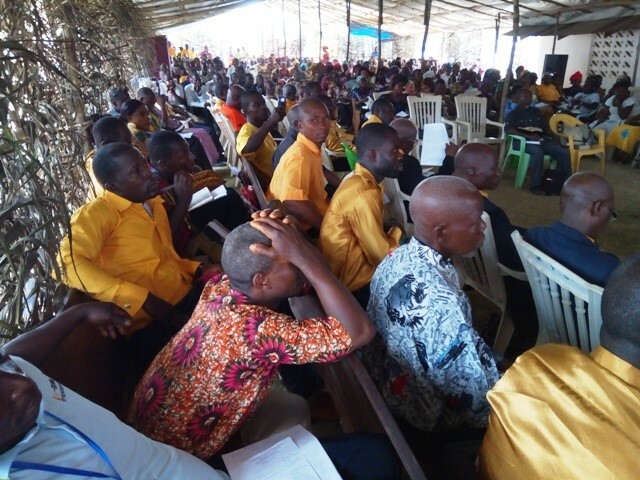 During the meeting,the Elders agreed in for the first time to allocate land for the construction of the first ever evangelical church in the Islamic Town.The team which comprises members of our church in Monrovia,college students as well as representatives of Great Commission Moment of Liberia. The roofing of the church was completed on Sunday 27th March (Easter Sunday) and that the first Divine Worship service was held on the same Sunday during which time most of the Muslims children attended.Four of them gave their lives to the Lord.However, during the course of the following week,these four children between the ages of 13 to 15 were rejected and sent out their homes by parents. As you pray, remember to pray for these needs. 1.That some of these Muslim parent will come to the point of accepting the Lord as personal Savior. 2.That support will be provided for care and education of the out cast kids due to their decision to accept the Lord. 3.That funds will be provided to build a health center and a school for the people of Weajor Town in the not distant future. 4.The provision of transport (Motor bikes) for team so as to enable them other places. Mbarma Town is also another strong hold of Islam.They over the years fought against the building of a church in this very Town.Now that the church has been built,they have invited a well to do Muslim who has promised to build for them a modern mosque and an Islamic school in the near future with a whole lot of promises.Brothers,given the level of poverty in this part of our country,we are concern that these radical Muslims might want to use their riches to miss lead our people.We made this mission trip to encourage the local pastors and to empower each one of them in God word in every sphere of life. Remember to pray for a Christ center school to be established in this Town and that the many Muslim children who are being taught by our pastor will know the Lord. That the church in the Town will grow and also our mission team will be able to visit regularly. III.The team also conducted two days leadership seminar in the Towns of Beaden, Campha Alpha and that of Tima Town. The condition of roads leading to these Towns are quite challenging as you will see in the photo report. Pray for the needs of all of our pastors as many of them just ordinary farmers struggling to survive.Pray that they will grow in their of the Lord. Also pray for our health and the total completion of the street girls building project this quarter. Special blessings to you all. Rev. Joseph G. & Victoria Armah, Sr. The vision of this project is to equip the Evangelical Church of Liberia with the funds required to engage meaningfully in multiple facets of Ebola response with the aims of protecting those at risk, providing for those who are suffering, and caring for those who are grieving. ECOL will intensify Ebola awareness campaigns, assist with the societal reintegration of those who survive, provide relief support to affected family members, and provide counseling services to those living through this trauma. Description: The purpose of this project is to equip the Evangelical Church of Liberia (ECOL) with the funds required to engage meaningfully in multiple facets of Ebola response with the aims of protecting those at risk, providing for those who are suffering, and caring for those who are grieving. ECOL will intensify Ebola awareness campaigns, assist with the societal reintegration of those who survive, provide relief support to affected family members, and provide counseling services to those living through this trauma. Liberia is still recovering from a crippling 14-year civil war. 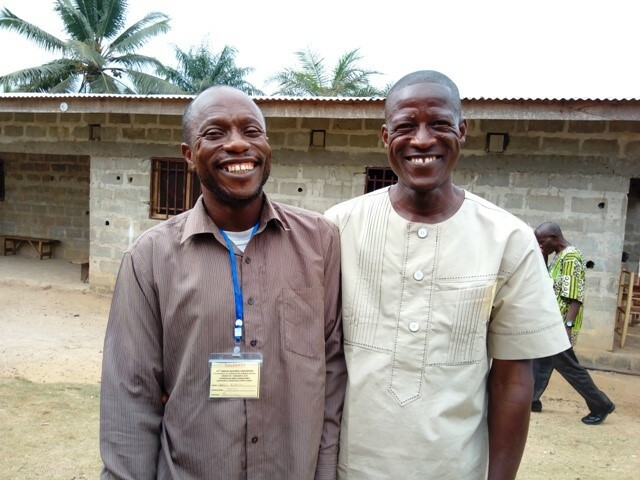 The SIM-related church, known as the Evangelical Church of Liberia (ECOL), is continuing to plant and nurture local churches. Currently there are about 110 churches. Rural ECOL church leaders are hungry for biblical training that will help them lead their flocks. Seminary for these servants of God is not an option as most of them will not qualify or cannot afford the tuition. This Project provides funding to enable ECOL to train local ECOL leaders and local missionaries to serve as rural pastors, church planters and evangelists. ECOL, in partnership with SIM, will set up mobile training teams to conduct training in ECOL’s eight districts nationwide. This allows about 300 participants, called by God and supported by the local church, to earn a two-year Bible certificate. Project funds will cover transportation costs as well as the cost of printing workbooks for each course. The church is growing in Liberia and this project will help build the capacity of the church and ensure strong biblical foundation. Investing in the next generation of church leaders is vital to sustain growth and bring the church to maturity. If you would consider contributing towards the vision of seeing rural church leaders equipped and trained to lead the church, then please contact your your nearest SIM office or give online to project 95034. For a complete list of strategic funding needs, click here. This project provides resources to enable the leadership of the Evangelical Church of Liberia (ECOL). ECOL, the church planted by SIM, now has about 110 churches, a membership of over 3,500 and a very low income. ECOL needs a national office, basic office equipment and transportation in order to meet the enormous task at hand. The project will provide help with the renovation cost of the SIM building, currently being used by ECOL, and some administration costs. This project is vital in building the capacity of the church.